The Disposable Powder-Free Vinyl Gloves are single use vinyl disposable gloves for a range of applications where dexterity is required. Featuring an ambidextrous design with a rolled cuff for extra strength, the Disposable Powder Free Vinyl Gloves are available in either blue or clear. The Disposable Powder-Free Vinyl gloves are supplied in a dispenser of 100 gloves. The Disposable Powder-Free Vinyl Gloves are both latex and powder free, reducing irritation and product contamination. 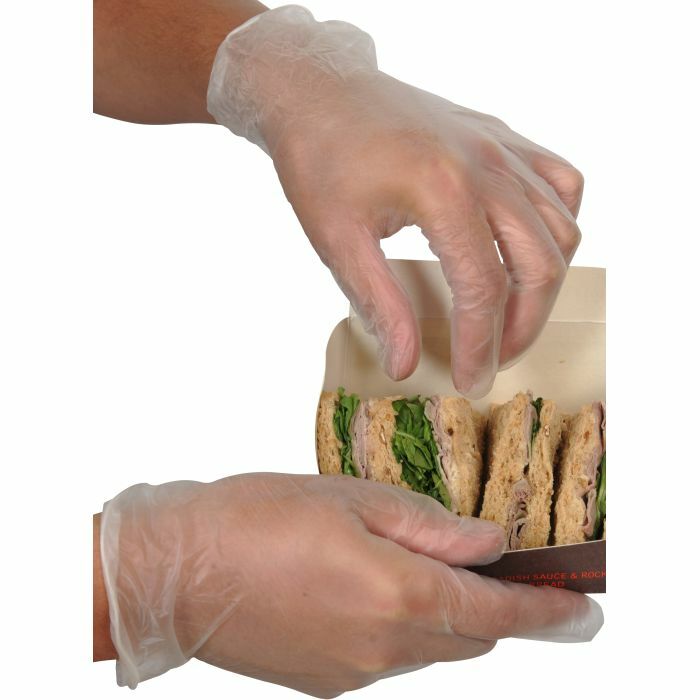 The Disposable Powder Free Vinyl Gloves are also suitable for use with food. Both new and used gloves should be thoroughly inspected before being worn to ensure no damage is present. Both new and used gloves should be thoroughly inspected before being worn to ensure no damage is present. Gloves should be disposed of after use and are designed for SINGLE USE ONLY. Care should be taken when removing gloves to avoid any contaminant contacting bare skin. Gloves should be ideally stored in cool dry conditions in the original package and out of direct sunlight. When stored as recommended will not suffer change in mechanical properties for up to 5 years from the date of manufacture. Service life cannot be specified and depends on the application and responsibility of the user to ascertain the suitability of the glove for the intended use. None of the materials or processes used in the manufacture of these products are known to be harmful to the wearer. The results of physical tests should help in glove selection, however it must be understood that actual conditions of use cannot be simulated and it is the responsibility of the end user and not the manufacturer to determine glove suitability for the intended use.